This page is dedicated to Edwin's treasured fans. If you have any fan photos or fan experiences you wish to be considered for inclusion on the fan pages please e-mail with details. All due credit will be given. Photos preferably in JPG format and no bigger than 320 x240 pixels with details of who, when and where taken. All material and photos will be looked after and returned to you within a few days (please ensure you enclose an S.A.E. or a return address). N.B. Please leave your tributes in Edwin's guestbook found via the Welcome page. If appropriate, e-mail submitted for the Fan Page may be used in the Guest/Tribute Book. 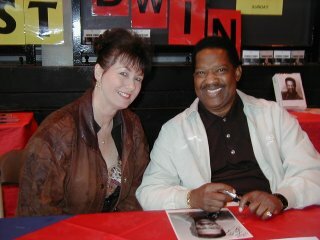 Submitted Feb 2013 I actually met Edwin Starr at the Twisted Wheel all-night club on 30 January 1971. This was the very last all-nighter at the club as it closed soon after. 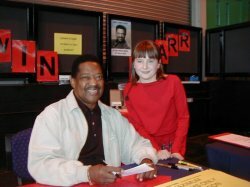 I had just turned 17 so you can imagine the thrill at chatting with him at the snack bar - there was no alcohol available at the club. Despite it being 42 years ago my memory is still pretty clear. I'm sure he was wearing the very same white fur coat as in the attached picture which he signed for me. Sadly the ink has faded but the imprint is still there. I can't remember what we said but the vision of the meeting is as clear as a bell. He went on to do a fabulous performance on a very tiny stage. I've not been back to Manchester since that day/night and now live in southern Spain where I play in a couple of rock bands. However, a family member now lives in Manchester and I'm going to visit later this month. A nostalgic trip to Whitworth Street is high on the agenda. I just hope its still there. The closure of The Twisted Wheel signaled the end of the soul scene for me but I still remember those days with much fondness. submitted April 2009 One for the road. 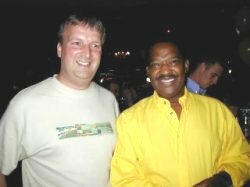 Went to the tribute to Edwin Starr at The Shed, April 11th 2009, what a night it was. My how Angelo has improved in professionalism and singing talent since I last saw him at Ilkeston two years ago. 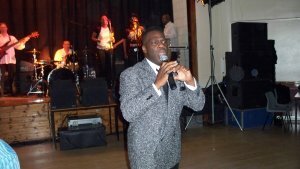 The Team were excellent and the showstopping performance of Angelo with Marvin Ruffin was exciting and just such fun to sing and dance along too. There was such passion for the old songs and they were so well received by the audience. Angelo sang his most beautiful song Cry For You. 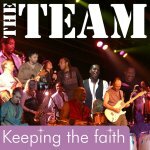 I bought Keeping The Faith and haven't stopped playing it since................. Jean your an inspiration to us all and long may love live on. This is a picture of our son Darryl with Edwin, I believe in 1999 at The Redbridge Show, we were great fans of Edwin and used to try and see him perform whenever he was in Essex or London for many years, in fact we went to his dressing room at The 100 Club in London to get our CD signed shortly before his sad death. We bumped into Angelo at a gig at The Brentwood Centre last year (he was in the audience) and promised to send this picture in to go on the web site. 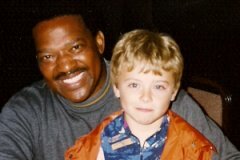 Pictured Darryl Baxter-Hearn Aged 10 (now 21). 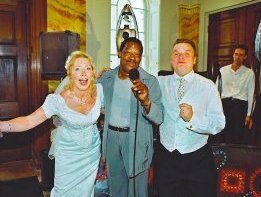 with kind permission of Mr & Mrs R Sharp of Chelmsford (the newlyweds) - what a wedding singer! I don't know if you get inundated with this kind of stuff but I was just looking through some old photos and came across some lovely ones of Edwin. Having said that all the photos of him are lovely because his personality just shone through - he's soooooo photogenic. 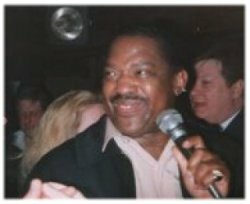 I think 3 of these were taken around Autumn 1988 and 1 possibly at Hollywoods nightclub in Romford, Essex where Edwin sang to a backing track. I went along to the latter just 'cos I went to any Edwin event that I could get to in Essex - difficult for an 19 year old at the time. I have tons of photos of Edwin and the Team taken at various locations - great memories. 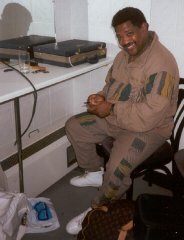 If you're looking for video footage of Edwin, I can remember there being a fantastic set-up at the Northern Soul Weekender in October 1989 at Vauxhall Caravan Park, Great Yarmouth. I believe Anglia Television were responsible for the filming. It was really professional with a 'track' around the perimeter of the stage (rather like a 'train track). That was the venue where Edwin tried to promote his 'Let's fall in love (tonight)' track. Hope this helps. 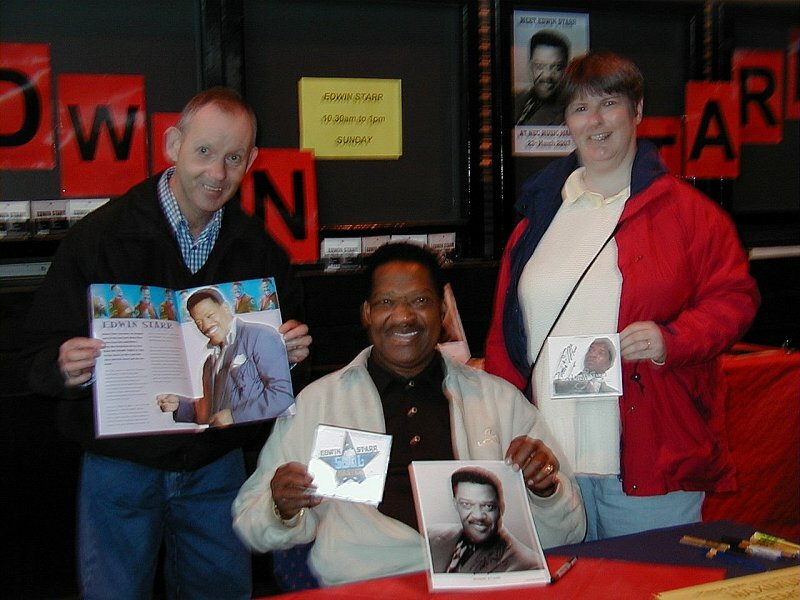 If it wasnt for Edwin Starr I wouldn't be doing the job I am doin' today.. we were on the same weekend bill as Edwin in Jan 2003 at Butlins Skegness. 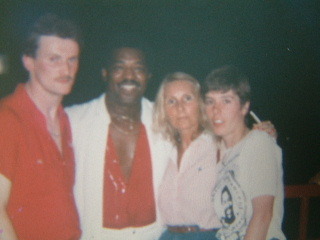 We went down the night before our gig and this was the night Edwin Starr was on.. so we hung around to watch his show. We were absoulutley gob smacked.. to play on the same stage as Edwin (even if it was the night before) was an absolute privelege.. we thought to ourselves if we can be on the same stage as this Motown legend then we have to be somewhere.. this is when we took hold of the reins and went professional.. having been on the circuit for a couple of years now. Everywhere we play and Edwins been before we always have a chat and everyone said what a gentleman he was..I think quite often of Edwin and always wonder what it would of been like to meet him.. if we can be half as respected as Edwin we're not doin' much wrong are we...our link is http://www.floorshakers.com ..thank you for your time. 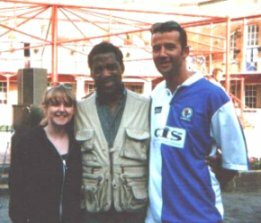 "This is a pic of me (Martin Evans AKA Taff) and Jeannie (friend) with Edwin at the Isle of Wight Scooter Rally 1998 after his set." 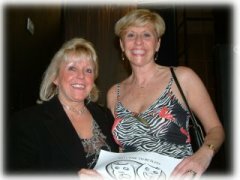 Great performer with the one of the most individual & powerful singing voices I ever heard. 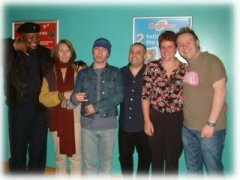 Some long-time fans of Edwin and the Team at the first Butlins gig after Edwin's death. 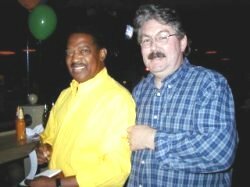 Just found the website dedicated to the living legend. What a showman. Top man in his own field. Seen him on numerous occassions.Noteable performances that stand out include a gig at Clitheroe Castle bandstand, along with Snake Davis.Must have been 16 years ago. Went to Blackpool on a wet horrible Wednesday, can't remember the name of the club but it was near the central car park. One of the lads had jeans on so we couldn't get in. Not to be out done we thought about it and went of to McDonalds.Why you ask ? Well, where else can you get a pair of trousers at 10.00 at night. Very kindly they gave us a pair and in we went. Again about 16 years ago. Another fine night was had at what was the Cavendish in Blackburn. Just before I got married, decided to go even money was more than a little bit tight but what the hell, its '"Our Edwin". Anyway the wife to be was not impressed and decided to throw a hammer at me whilst in the bath. Big bang on head, pouring with blood, off I went to see another legendary performance. That was back in 1985. Four years ago I had the great pleasure of taking my son (aged 4) to see one of my all time favourites. Outside at a weekend festival in Morecambe. An absolute top drawer concert. 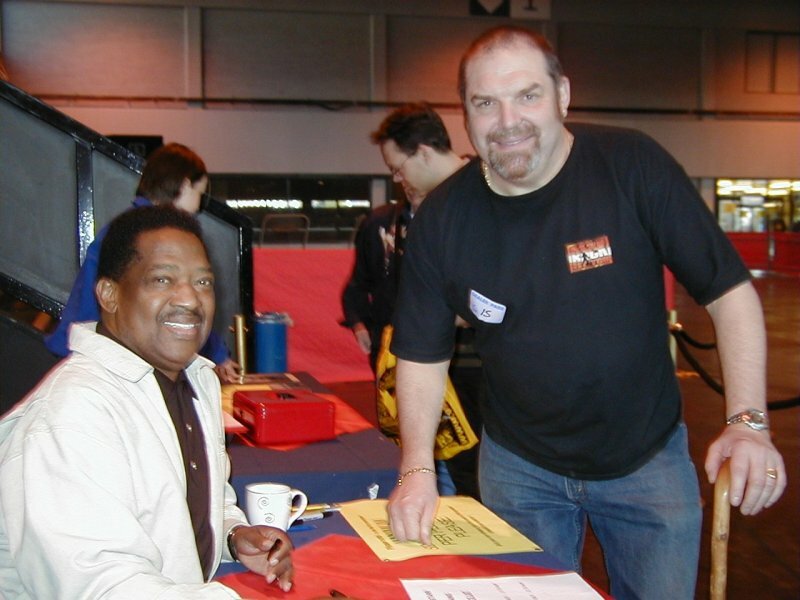 Edwin Starr top man in his own field. Long may he continue. 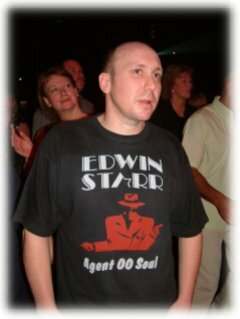 On behalf of the many fans of Edwin on the Irish soul scene, I wish to extend our deepest sympathies to his family and friends. We are deeply saddened at this great loss. Edwin's music has given us more pleasure than could be put into words. He will be greatly missed. If a tribute is to be made to him, I think the most fitting one, in light of recent world events would be to re-release his classic "War". He is already in the hearts and minds of those who have known and loved his music for many years and a re-release of this, especially at present, most poignant of songs would indeed be a fitting tribute and would perhaps introduce his music to a new generation. i was completely shocked by the devestating news yesterday. all i can say about edwin is that i will never forget the first concert i saw of him. 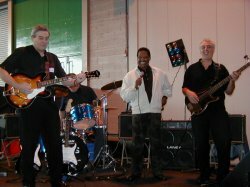 he was supposed to play at a scooter rally in aachen, germany on a friday night in 91 (or was it 92), but somehow, they had problems on the motorway on their way to the rally, so they turned up at 7 in the morning. but it didnt hold him from starting his concert at 8 am. 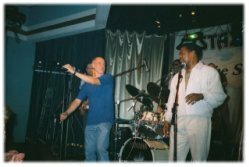 everybody had been drinking heavily the night before, so it took some time, but once the word was spread, (and the sound was heard clearly) we had a brilliant concert from about 9 - 12- edwin sitting on a lambretta on stage and truly doing what he did best. giving it all. they are really getting a good set up in soul heaven now. probably he is already getting down with marvin and curtis. gone but not forgotten. On behalf of all the scooter scene, i send my deepest wishes to his family, he was a great man and was always meeting ang greeting us. He loved all scooter rallies and will be missed. No one can fill his place. Allan Woodall, Dudley, West Midlands. Althuogh Marvin Gaye is credieted as being The MASTER of Motown, Edwin was beyond doubt The GENTLEMAN of Motown. A true gent always. 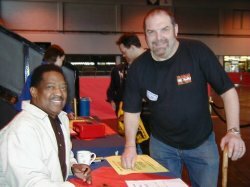 The first time taht I saw him live was in April 1973 at The Plaza Ballroom in Old Hill, West Midlands. The place was packed to the rafters, Edwin was awesome. 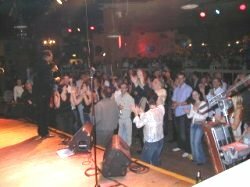 He invited a few from the audience to join him on stage, I was one of the lucky ones. We were privaleged to sing with THE MAN!! Brilliant. My thoughts are with his family and many friends at this sad time. 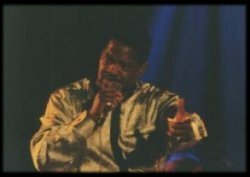 EDWIN STARR R.I.P. 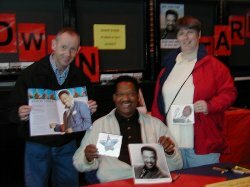 I first saw Edwin Starr at Baileys night club in Oldham in 1977, I was just 16, but already a big soul fan, soul boy/mod, At this particular time Edwins career was not going great and he was touring the cabaret style clubs to ressurect his career, nonethelees me and a mate went to see the legendary Edwin Starr. 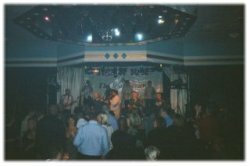 it was a Wednesday night and there could not have been more than a hundred people there to see him, the dj on the night offerd a competition shortly before he came on, he asked who could name thre eof Edwins hits? I rushed to the dj box all excited, and told the dj, Stop her on Sight, 25 Miles and War, I was announced the winner, the prize was a meal for two, chicken and chips in a basket and a photograph with the great man himself. 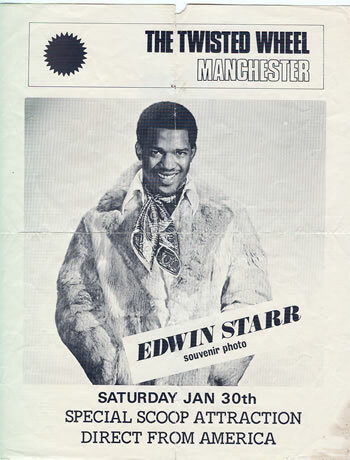 As I was out with my mate, it was he who shared the meal with me as we watched Edwin Starr put on a magnificent performance, even though the venue was almost empty. The energy and passion Edwin put into his show knocked for six, a brilliant show and very one of the hundred or so danced their hearts away. The following year Edwin had a massive hit with Contact, the next time I saw him was in the mid 1980's when his career was once more in decline, but he still put on a great show, I then saw him regularly in the late 90's at the scooter rallies and Mod nights, now he was big time again and playing to huge audiences, I often wonderd just how much longer he could last at that pace, bearing in mind his age etc, he amazed me with his passion and professionalism, it broke my heart to hear of his death, he was and always will be a true hero to Mods of all generations from the 60's, the Mod revivalists of 79-84 and todays Mods, I am a dee -jay and all this weekend the punters will be getting a heavy dose of Edwin Starr, they usually do anyway, they love him, farewell Edwin Starr, Soul man supreme. We would like to offer our deepest condolences to Edwin's family, friends and fans.The shock was so great to us it feels like a personal loss.The last time we saw him was at the Winding Wheel in Chesterfield and as usual he was brilliant. A very talented man and loved by many. He will be sadly missed. Please give details of his funeral as we would like to say our goodbyes. He cared for his fans and now his fans would like to show how much we cared for him. Other tributes have already covered it, but this man epitomised the 'Scene' in all it's glory. 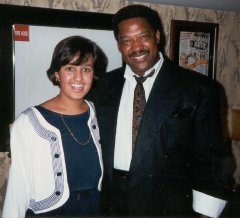 He was cool, courteous and a true professional. I count my self lucky to have seen him several times, at places such as Wigan, St.Ives, Peterborough. Each time, he blew the audience away, but one occasion will always be best remembered by me, in particular. He performed at The Guildenburgh Club in Peterborough, and on this particular occasion the pre-recorded backing was 'playing up'. He halted the show and told the sound manager to turn it off! He then asked the audience to 'please help' by accompanying him with sound and vocals!! All I can say is, that you really had to be there, to see the whole crowd, singing and dancing both off and on the stage! The man brought everyone together like only he could! Afterwards he came down to the bar, and bought drinks for everyone at the bar! What a 'Class Act'!! I met him only briefly that night, but he will always be The Guv'nor as far as I am concerned. I, and many, many more, especially in the UK, will miss him tremendously! I am sure the angels have had to make room for a lead chorister, as the world must count itself richer for having once held this Ambassador of Soul. 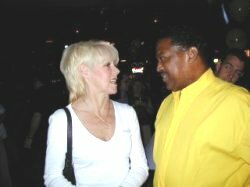 Edwin, I count my blessings to have met you, and I know that I have been privileged to have seen the greatest Soul performer of my time! I am just one of the many fans that thought Edwin was a star. 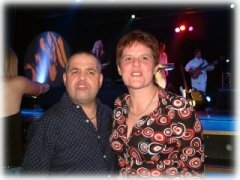 Me and my family have seen Edwin many times and each time was better then the last. We loved the way he got everyone in the room moving and enjoying themselves. He was a true talent. Hi songs always guarentee a good party. Thank you Edwin - we will miss you but your music will live on. i would like to say how much edwin has meant to our family, we went to butlins every year just to watch him and have vowed to keep his memory alive for all the joy he has given us and many other people. thankyou edwin you will live forever! 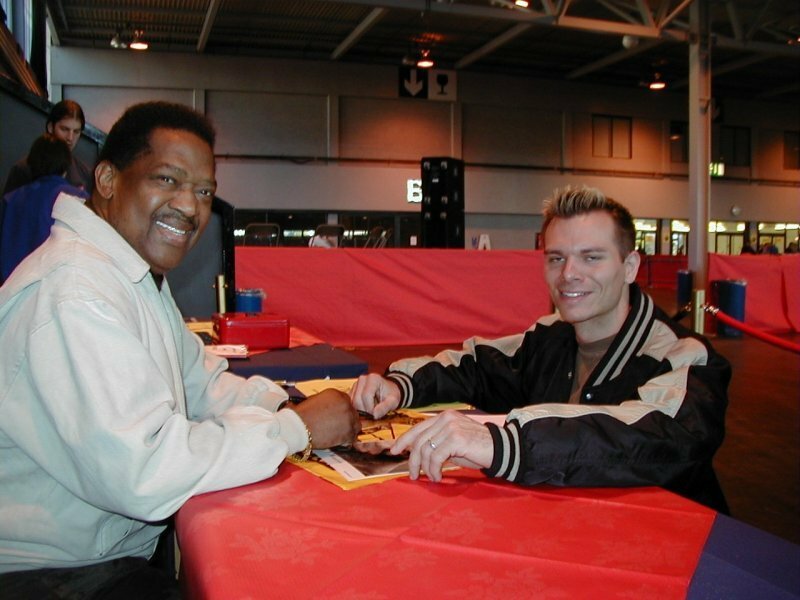 ...It was a great night and Stax of Soul could not believe Edwin had asked them to do another few numbers back on stage with him. Edwin signs merchandise for fans at the above event. Larger photos are available on click.